This Adoration of the Magi tapestry shows the three wise men going to see the newborn Christ child, based on the design by Edward Burne-Jones (1833-1898) and first created by Morris & Co in 1887. The intricate textures of the garments worn by the wise men as well as the angle and his wings, contrast with the rich floral, wood and foliage filled forest scene in the Morris style of mille fleur, echoed in the humble thatched roofed stable where mother Mary is holding the infant baby. The bold use of color brings this superb image to life. In the Victorian era, this style of art and decor design represents the importance of unique beauty in home decor. 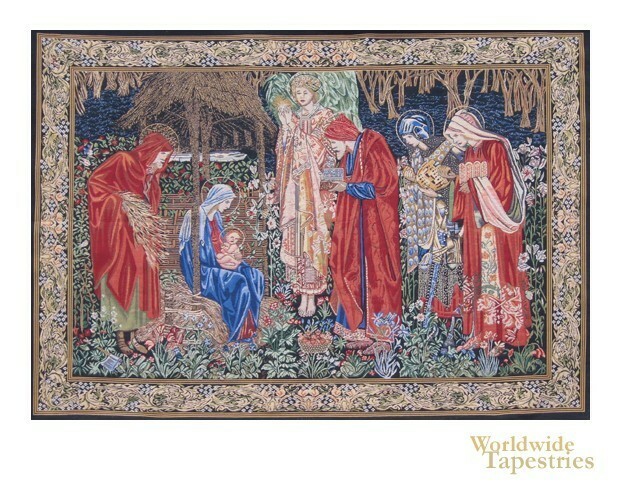 This Adoration of the Magi tapestry is lined and has a tunnel for easy hanging. Dimensions: W 39" x H 28"
Dimensions: W 57" x H 40"